Diagnosed with lethal pancreatic cancer, Geri Perrotte made a desperate pilgrimage to the mecca of the medical world: Mayo Clinic. There, last November, doctors hoped to perform a complex operation to remove the tumor. Once they opened her up, however, they found the cancer was too advanced to remove, so the surgeon left the pancreas intact and stitched her up. Afterward, Perrotte, 63, was told she had months to live. "I was totally devastated," she said. "I would never be able to see my grandson grow up. I would never grow old with my husband." She went home to Chicago and began to plan for her death. She would give a family heirloom ring to her daughter-in-law. She considered how to part with a beloved collection of antique costume jewelry. She made tape recordings for her 4-year-old grandson, Jack, whom she had helped raise from infancy, trying to explain how much she loved him. In her grief, almost by chance, she heard there was a doctor at Northwest Community Hospital in Arlington Heights who might be able to help her. He was known for performing highly complex, risky operations on the pancreas that other doctors wouldn’t touch. Perrotte underwent an eight-hour operation in January to remove the tumor. The cancer had wrapped around a nearby critical vein, which had to be cut out. A piece of a vein from her neck was used to reconstruct it. Today, Perrotte is ecstatic to be alive. She is incensed, though, that no one had told her before that there might be a surgeon who could save her life in her own back yard. And now she wants others with pancreatic cancer to know there is hope. Among all major cancers, pancreatic cancer is the surest killer. It’s ended the lives of a long list of well-known people, including actors Patrick Swayze and Michael Landon, and Cardinal Joseph Bernardin, archbishop of Chicago. Three out of four people with pancreatic cancer die within the first year of diagnosis, and 95 percent die within five years. The main reason it’s so deadly is that its symptoms – stomach or back pain and digestive problems like loss of appetite and weight – are often vague, unnoticed or easily blamed on other problems, until it’s spread in the body and is too late to treat. There is one small group of pancreatic cancer patients who can be saved: those caught before the disease has metastasized to other organs. For these – fewer than 15 percent of pancreatic cancer patients – surgery may be an option. The operation to cut out a pancreatic tumor is known as a Whipple procedure. It also typically involves removing a portion of the gallbladder, bile duct and duodenum, then reattaching everything directly to the intestine. Years ago, up to one-quarter of patients died during the procedure, but now fewer than 5 percent do at advanced hospitals. The Whipple is mainly performed at advanced academic centers. Doctors elsewhere may do it a few times a year, but studies show the more often a hospital does it the better the outcomes. Dr. Malcolm Bilimoria, who operated on Perrotte, has performed the procedure more than 700 times, never losing a patient during surgery. More than two dozen of his Whipple patients are still alive more than five years later, and are considered cured. 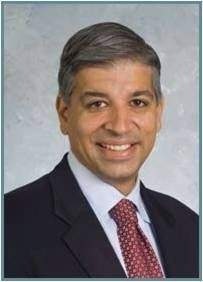 Bilimoria learned his craft at Northwestern University and the Anderson Cancer Center in Houston, Texas, then worked at Evanston Hospital, before being lured to Northwest Community Hospital last year for the opening of its Illinois Center for Pancreatic and Hepatobiliary Disease, which specializes in treating the pancreas, liver and bile ducts. Dr. Paul Grippo, an assistant research professor in surgery at Northwestern, used to work occasionally with Bilimoria. "Dr. Bilimoria is probably more willing to take those advanced cases than anyone I know," he said. "He is an outstanding surgeon." Bilimoria has been accused of having "magic hands" for his dexterity at the tedious cutting and reattaching of many fine veins, organs and other tissue. He often goes by feel, squeezing the soft pancreas lightly to feel for the harder tumor, like a rubber ball inside a sponge. Over almost nine hours of surgery with Perrotte, Bilimoria carefully cut away the tumor, and kept sending samples to the lab until he was sure there were no cancer cells in the remaining tissue. To replace the damaged portion of the portal vein, he used a section of vein from Perrotte’s neck. "It’s tricky work," Bilimoria said. "In a surgery this big, there are so many places you can get tripped up. "But there’s no magic in these hands. All there is is my own perseverance, my own blood, sweat and tears, and a lot of experience, to try and see if I can hit a home run." The operation is only for those who catch the cancer early, before it’s spread. Often, scans looking for other problems detect it, as was the case for Perrotte, whose doctor found a spot on a CAT scan for a previous back surgery. It also helps if patients are younger, in their 40s or 50s, and otherwise healthy. The Whipple procedure can lead to serious complications such as pneumonia, infection, temporary stomach paralysis and diabetes, or less serious but nagging digestive problems and weight loss. After surgery, patients get radiation and chemotherapy to try to kill any remaining cells that may have been missed. Mayo Clinic did not comment on Perrotte’s case, but spokesman Karl Oestreich wrote that its surgeon is "perfectly capable" of removing pancreatic cancers involving the portal vein, but it’s a question of whether it’s worthwhile. Deciding whether to remove the tumor, he wrote, often depends on whether the disease has advanced enough that surgical removal won’t significantly help the patient’s survival. Despite the risks of surgery, many patients can go back to a normal lifestyle. Bilimoria has had other patients return to professional golf and running marathons. Another survivor, Susan Abraham, 54, of Schaumburg, had the Whipple three years ago with another surgeon at Alexian Brothers Medical Center in Elk Grove Village, after she felt pains in her left upper abdomen, under her rib cage. "For me, there was no choice, because I could either die from pancreatic cancer or take the surgery," she said. She has some remaining digestive problems, and has to take enzymes to digest fat, but otherwise is doing well. "If it’s caught in time," she said, "there is hope and you can survive this disease." As for Perrotte, a post-operative scan showed no signs of cancer, and Bilimoria marks her prognosis in years instead of months, but it will be five years before she knows if she is out of the woods. For now, Perrotte is again baby-sitting her 4-year-old grandson, visiting with friends and planning a trip with her husband to "eat our way through Italy." And Bilimoria is trying to prove that a community hospital can offer the same high level of service as the big teaching hospitals. Freshly back from a volunteer trip to do surgeries in Bolivia, he finds inspiration in his patients. "One of the reasons I love what I do is all the patients are fighters," he said. "No one walks through the door without that fighting attitude."